BroView S Series S7 9006 HB4 8000LM Headlight Low Beam 50W LED For Dodge. BroView S7 50W 8000lm LED Headlight Kit H7 Low beams 6000K Bulbs 1 Pair. BroView M5 9008 H13 3000LM/PC 22W Cree LED Dual Beam Headlamp for Ford. H13 9008 CREE LED Headlight 9145 9140 Fog Lights Combo for 2004-2014 Ford F-150. Pair 9007 2300W 345000LM CREE LED Headlight Kit High/Low Beam Bulbs 6000K 2pcs. CREE H4 LED Headlight Kit Light Bulbs Hi/Lo Beam 6000K 9003 HB2 1850W 277500LM. 9007 HB5 LED Headlight Conversion Kit 1700W 255000LM HI-LO Dual Beam Bulbs 6000K. 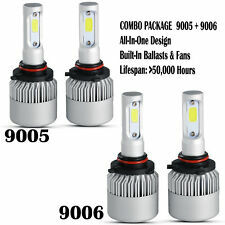 4x Combo H11 9006 LED Headlight 2800W 420000LM High Low Beam Combo Kit 6000K. H4 9003 LED Headlight For Honda Civic 1996-2003 Hi/Low Beam 1600W 240000LM 6000K. BroView Headlights Professional ! BroView M Series Model M5. Feature: 5-Colors Available, You can freely DIY the light color along with the change of weather. Interchange Part Number: H13, 9008. Application: Headlamp Dual Beam/Headlight High Low Beam. We will take care of the problem and do our very best to make you happy! T10 = W5W 194 147 152 158 159 161 168 184 192 193 259 1250 1251 1252 2450 2652 2921 2825 921 906 579 555. 4pcs T10 194 Light Bulbs. Color: Ice Blue. LED Type:4-3528-SMD. High quality SMD, much brighter than normal LEDs. Interchange Part Number: H13 9008. Application: Headlight /Headlamp Dual Beam/High Low Beam. Light Ring can be detachable our of the light (this GIF Picture show the details). Beam Angle: 360°. Maximized 360Â° beam angle, enhance 30% of effective range compared to halogen lamp. LED Type:Â T10 SMD LED. T10 = W5W 194 147 152 158 159 161 168 184 192 193 259 1250 1251 1252 2450 2652 2921 2825 921 906 579 555 etc. 4 x T10 6-3020-SMD Blue LED Light. Number of Bulbs:Â 4 PCS. LED Color:Blue. Application:Apply for Angel eye Headlight Halo ring. Color Tempurature: 6000K White. Weight: 80g. Our Automotive LED headlight advantages . Bulb Size: 9012. -LED Type: CREE LED chip high power. -Color Temperature: 8000K ICE BLUE. -Beam Type: High Beam / Low Beam / 360°Beam Angle. light shield of the headlight when adjusting the bulb. -55W Per Bulb, Low Power Consumption. Power: 1400W. Plug Style: 9006, Low Beam. 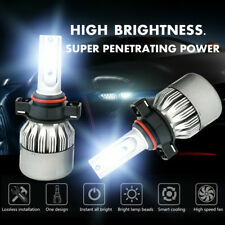 2pcs 9006 LED Headlight Bulbs. Application: Headlight Bulbs Low Beam,fog lights. LED Type: Imported CSP LEDs. We are professional LED Light Bar / Headlights manufacturer. SPECIFICATION: Ø Color: Silver Ø Operating Voltage: 10-30V DC Ø Waterproof rate: IP 68 Ø high intensity CREE LEDs Ø Optional Color: Chorme Ø Color Temperature: 6000K Ø Material:Diecast aluminum housing Ø Lens material: duranble Polycarbonate Ø Mounting Bracket: Stainless Steelt Ø 40000 hours above life time . Ø Dimensions：4 *6 " Ø LED Power: high beam 55w 6000lm ,low beam 45w 4000lm Ø Angle eye and position light 10W Packeage included: 2PCS 4x6" Headlight. 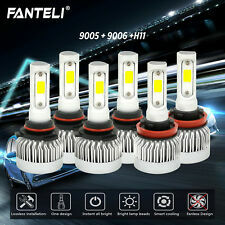 （6pcs/3 set） 9005 9006 9005 LED Headlight Conversion Kit. Usage: Headlight. LED lights than traditional halogen energy, more power. Color Temperature: Pure White 6000K-6500K. We are professional LED Light Bar / Headlights manufacturer. The compatible vehicle lists is only partial lists,no fully included due o Ebay listing compatible vehicles limitation. IF your car Socket type is 9012 HIR2,the item is fit your car Specifications. Latest COB chip light source,3 luminous faces (270/360 degree) no blind zone. 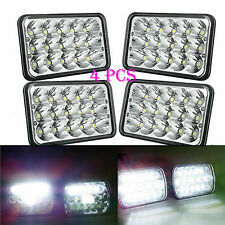 （6pcs/3 set） 9005 9006 9005 LED Headlight Conversion Kit. Usage: Headlight. LED lights than traditional halogen energy, more power. LED type: CREE COB LEDs. 2x H13 2x 9145 High Power LED HeadLights Bulbs. Application: High & Low Head Lights & Fog Lights. To Fit: High & Low Head Lights KIt & Fog Lights Kit. LED lights than traditional halogen energy, more power. The compatible vehicle lists is only partial lists,no fully included due o Ebay listing compatible vehicles limitation. IF your car Socket type is 9008 H13,the item is fit your car Specifications. 4x LED Headlight Sealed Beam For FREIGHTLINER FLD 120 FLD 112 Kenworth W900L HID. Beam: high/low beam. LED Power:45 Watt EACH 3W/PC. Vehicles with this type of headlight - see application or your owners manual. 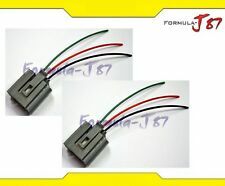 Compatible With: H13 / 9008 High / Low Beam. LED type: CREE COB LEDs. Color Temperature： 6000K White. 2 x High Power LED Headlights Bulbs. Number of Bulbs: 2. LED lights than traditional halogen energy, more power. H11 9006 9005 LED Headlight Fog for Toyota Corolla 09-2013 RAV4 06-2011 675000LM. 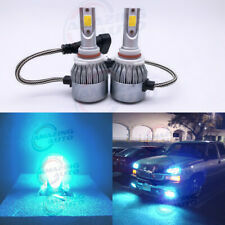 H11 9005 6000K LED 5000W 750000LM Combo Headlight Hi/Lo Beam Foglight Lamp Bulbs. 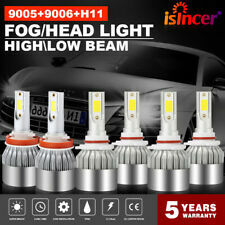 H11 h9 h8 LED Headlight 6000K White 1500W 225000LM Conversion Kit Low Beam. Compatible With: 9005 / HB3 9006 / HB4 H11 / H9 / H8. 2 x 9005 High Power LED Lights Bulbs. 2 x 9006 High Power LED Lights Bulbs. 2 x H11 High Power LED Lights Bulbs. Color Temperature：6000K White. Power Low Beam 20W High Beam 45W Operating Voltage:12V DC DRL Color: White Line and Red Center Lumens: 15500lm (Low Beam) 3200lm (High Beam) Waterproof rate: IP 68 Color Temperature: 6000K Working Temperature:-45 ~ 85°C Material: Diecast aluminum alloy housing Lens material: PMMA Mounting Bracket: Stainless Steel Dimensions: 6.18 x 4.36 x 2.96 inch Lifespan: 50,000 Hours Package including: 4pcs 4x6'' LED Headlight. Bulb Color:RGB. Note:When the headlight turn on,It will be super bright white beam and also cover orignal colorful beam. 2x LED Bulbs. Light source: High power COB LED chip. Material: LED Top Quality Aviation Aluminum 7. The compatible vehicle lists is only partial lists,no fully included due o Ebay listing compatible vehicles limitation. IF your car Socket type is H10/9140/9145,the item is fit your car . ◇CREE XHP 50 LED headlight kit was design to replace the existing old halogen and HID headlights in your vehicle. Upgrade your headlights to brighter and better in less than 20 minutes; just plug the LED headlight to the original headlight socket and you're done!